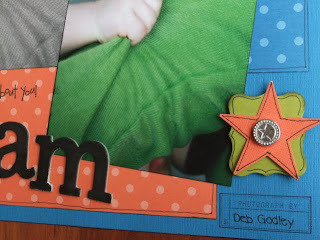 I am on a roll with the scrapbook pages lately...and it is challenges I have to thank. There is something about it that narrows all the choices and lets me just create rather than staring at my enormous craft stash and wondering where to start. If your mojo is missing I would definately suggest attempting a few challenges. 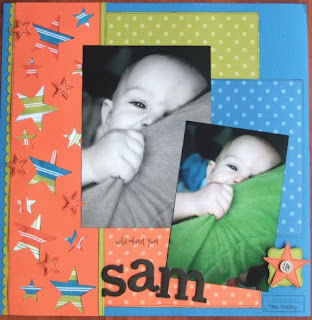 I recently discovered another scrapbook challenge. 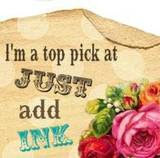 This time it is at Stampin Addicts. This week the challenge is to use your ribbon scraps and I soon as I read it I new exactly what I was going to do. There was a card featured in the Summer Mini catalogue that used the negative space from the Heart to Heart punch and had ribbon behind it. I had stored the idea away to use one day and this was the perfect opportunity. 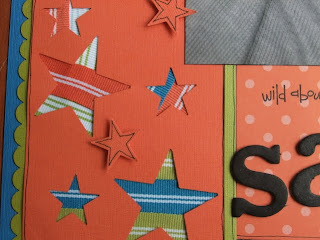 I started out with a strip of Tangerine Tango cardstock and punched out small and large stars. I then turned it over and stuck on my ribbon scraps turned it back over and voila a cute textured border. I added some extra small stars that I had doodled around and popped them up on dimensionals. 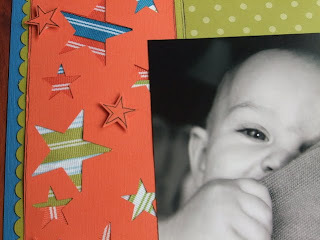 I used the Curly Label Punch and another star together with a Designer Brad to make a matching embellishment. These photos of my gorgeous Sam were taken by my friend Deb Godley and the Art by Design stamp set has a stamp just perfect for giving her credit. I thought that was very cute when I found it. My chipboard letters for the title were sponged with black ink and I also stamped the "Wild about you" from the Wild About You stamp set in black ink. My photos were all edged with Stazon to help them pop off the background.